OK,so now we are down to the wire and school will start next week (in most places around the country it started already) and there is still time to finish off your school shopping and get some nice tech items. There is a few more gadget and other stuff I want to recommend.This time its more random and does not fall in any particular category like the other tech related gadgets I've listed thus far. Here's a list of more tech and other stuff I recommend for school. Looking to purchase a nice quality monitor without spending an excessive amount of money,then the Dell UltraSharp UZ2315H is your best choice. No its not 4K nor does it have G Sync technology,then again who needs 4K when there still isn't enough content being filmed in 4K. Anyhow, the Dell UltraSharp is nice 23-inch monitor with all the additives you need for viewing any content that is 1080p. Perfect monitor for video Skyping and other multimedia use. This monitor is prefect for all of the recommended desktop computers I listed for back to school. Students are always backing up content to either external storage devices or onto the cloud. You need external hard drives that's stable and rugged enough to withstand drops and water damage,well what do you know,I have the perfect external drive for you,the LacCie Rugged Thunderbolt 1TB. Nice and rugged of course hence the name,enough space to store all of your written term papers ,study guides and your photos. The added attractive feature is Thunderbolt technology which has up to 387 MB/s transfer speed, it also has the standard USB 3.0 connectivity. The LaCie Rugged external drives is tough enough to withstand shock,dust and water. In my opinion one of the best laptop backpacks which I took the liberty in purchasing it for myself. Very compact,yet it has a lot of room inside to house your 15-inch laptop and all of your $100 text books. The material used on the Logic DLBP laptop backpack is high quality and very resistant to liquids. You would think a laptop backpacks like this would cost you a fortune,it retails for only $31. Another highly recommended product from me because I actually own it,but it also performs well. 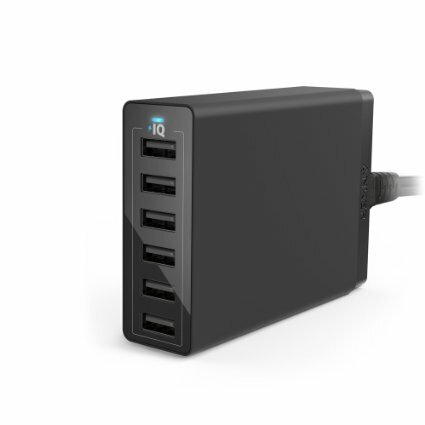 The Anker PowerPort USB charger is the perfect solution to simultaneous charge all of your devices. Anker has implemented Fast Charging Technology that can rapidly power up all of your devices. Its compatible with Android and iOS devices,smartphones and tablets. You need to listen to music while walking to class or school,the perfect set of earphones for this is the Brainwavz Delta Silver. One of the best earbud earphones I ever purchased to date. Great sound,decent remote mic, nice design with the L-shape jack which extends the life of the earphones because we all know in-earbuds have a very short lifespan,you get all this at just $22.